It’s that time of year, again! Time to clean out your closet, donate your used items to Goodwill, and refresh your wardrobe with 30% off at Boston Store! If you’ve been following along on my blog over the past year or so, you know how much I love Boston Store’s semi-annual Goodwill® Sale! 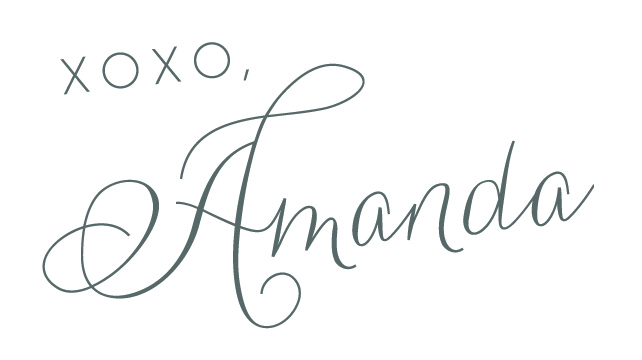 Not only do you get to add some wonderful pieces to your closet at 30% off (or more! ); you get to help the community by donating items for a great cause! A few of the pieces I donated to Goodwill during this sale! WHAT IS THE BOSTON STORE GOODWILL® SEMI-ANNUAL SALE? + Since 1994, the Boston Store Goodwill Sale has been giving shoppers the opportunity to have a positive impact on their communities by donating clothing and household goods to Goodwill at their local Boston Store. + Company-wide, the goal is to collect more than 1.75 million pounds of donations, which would provide about 233,000 hours of job placement and training services at local Goodwill organizations across the country. + Donations are sold at Goodwill stores within the communities in which they are collected. The donations are vital to helping Goodwill provide the services people need to find employment and care for their families. Donating is super easy. 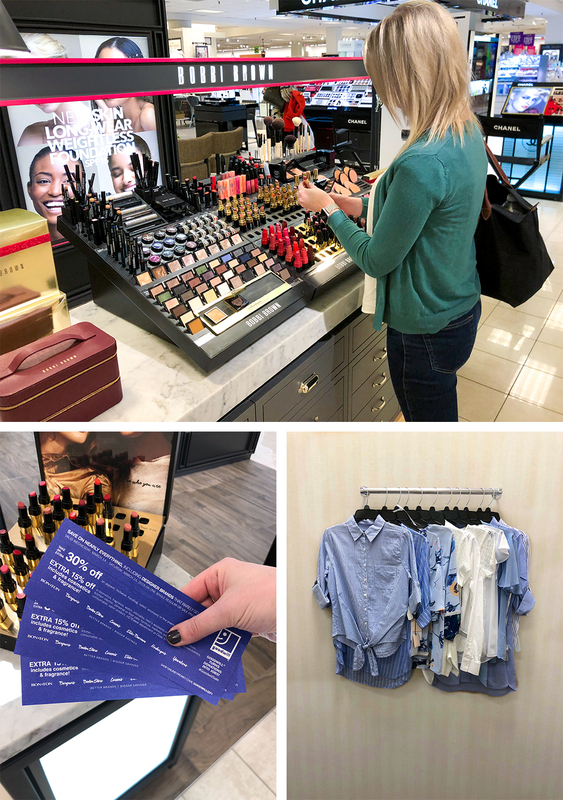 You can simply clean out your closet and donate your items at your nearest Boston Store (or other stores in the Boston family including Bon-Ton, Bergner’s, Carson’s, Elder-Beerman, Herberger’s and Younkers stores)! Goodwill accepts many different types of items: men’s and ladies’ shirts and blouses, business suits, shoes, outerwear, jewelry, accessories, and soft home goods like blankets. 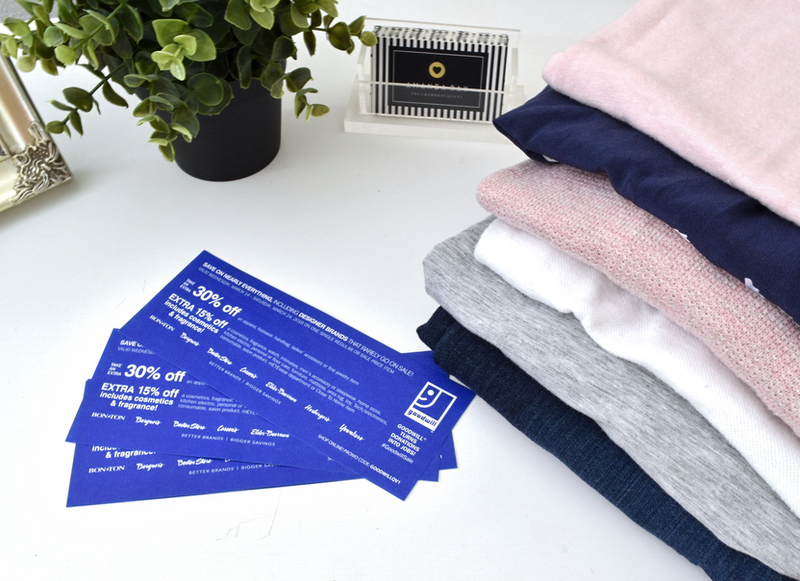 For each item you donate, you receive three 30% off coupons to use on your wardrobe refresh! You can even use the coupons in the beauty and fragrance departments for 15% off! Above, you’ll see a peek at the items I tried on! 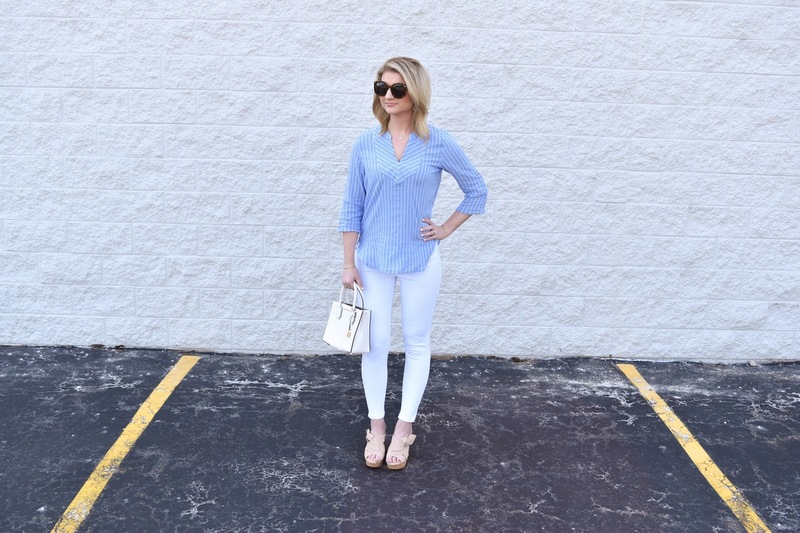 I’ve been gravitating towards a lot of blue and white lately (can you tell?)! 🙂 Take a look below for two new outfits that I styled using pieces I purchased from the Boston Store semi-annual Goodwill® Sale! 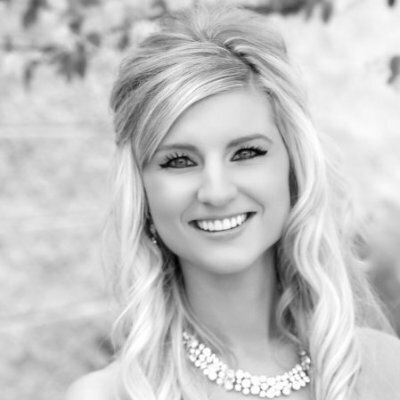 This look is perfect for spring and resort wear! 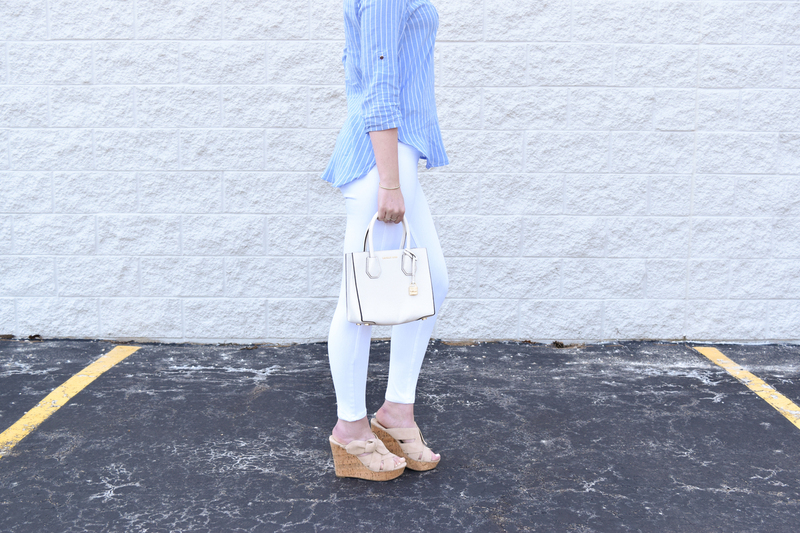 I love the neutral wedges that go with everything and the blue striped top that screams warm weather! The options are endless, but pairing the tunic with white jeans and a white handbag will definitely be a go-to of mine! With this outfit, I went a little bit out of my comfort zone with the bell-sleeve blouse! But guess, what?! I love it! 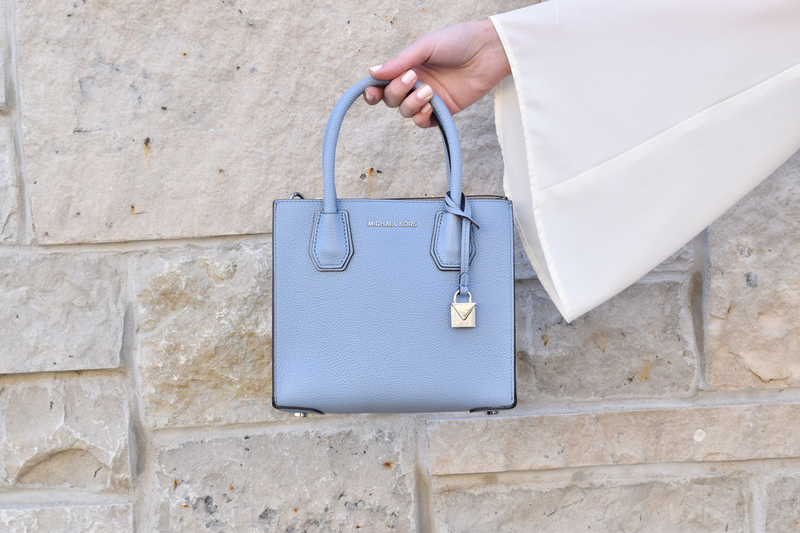 It’s so feminine and works great paired with jeans, wedges, and this adorable Michael Kors bag in pale blue that was 25% off! I definitely feel like enjoying spring weather in this outfit! WHAT WILL YOU DONATE & WHAT DO YOU HAVE YOUR EYE ON? Don’t forget to bring your donation to the Goodwill drop-off at your local Boston Store from now through Saturday, March 24th. For each donated item, you will receive three Goodwill Sale coupons, up to 30% off (which are valid the duration of the sale)! But don’t worry if you don’t have any items to donate! You can also donate $1 to Goodwill at any register to receive three Goodwill Sale coupons. 100% of the $1 donation benefits programs at local Goodwill organizations! The Goodwill Sale is such a great time to refresh your wardrobe and home while getting great deals on new spring trends! What pieces do you have your eye on? I love the idea of shopping at a store that helps the community! That bell sleeve top is beautiful and you make it look amazing! Yes! It’s such a great sale! And thank you, you’re too sweet! Thank you, Sarah! 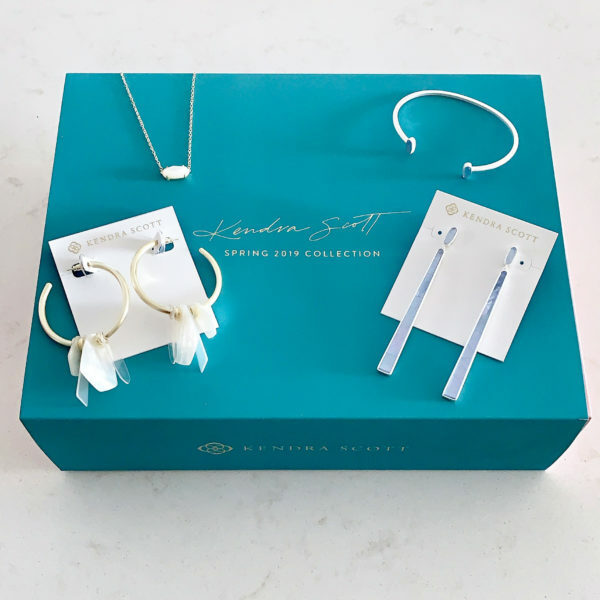 Yes, head on over – you’ll love the new pieces they have for spring! Your picks are amazing!! Is that white top TTS? Thanks so much, Carly! Yes, I got my typical size in the top. You’ll love it! What a clever idea. I usually just donate my items at the local goodwill shop and be done with it. Having a store team up to incentivize donations and get business makes a lot of sense. I will have to check out Boston Store. Thank you! It’s such a fun color for spring!! Thanks, Jessica! Yes – the sale is the best – you’ll definitely find some great pieces you’ll love! I see you got a white AND pale blue MK bag?! I LOVE them! I have a black one and I’m thinking of buying more colors! I just did a spring cleaning closet clean-out but I could honestly do it again ! Both those outfits are so cute! I love it when we find a smashing bargain. =) Happy Spring! This screams of Spring! I am SO ready to ditch my Winter wardrobe.